Solivita is consistently in the top 10, but where did it fall on this month's list? Winter is hopefully coming to an end soon and, as it does, it might be the ideal time to start your search for an active adult community to call home. It can be hard to know where to begin, which is why we recommend seeing what other 55+ buyers are looking at in order to get a sense of what’s popular and what’s in demand. There’s no better time than right now to check in with 55places.com readers to see which communities they considered last month. We took a look at 55places.com traffic between February 1 and February 28 to determine the ten communities that received the most visits overall. Chances are you’ve heard of some of them already, but feel free to dig around and see why they’re so popular. On Top of the World returns to the top spot on this list. With 10,000 planned homes, this sought-after community strives to provide residents with every convenience and luxury they need. Homeowners can even participate in over 175 organized clubs that keep them physically and socially active, from pickleball and bowling to gardening and traveling. After retaking the top spot last month, Latitude Margaritaville Daytona Beach dips down to No. 2 overall. We’re getting closer and closer to the launch of amenities, which will include a town square with live music, a resort-style pool, and a private beachfront club on the Atlantic Ocean. And now that resales have begun here, we expect the interest to keep going. As one of the largest 55+ active adult communities in Florida—and the world—many homebuyers want to learn more about Florida’s Friendliest Hometown. 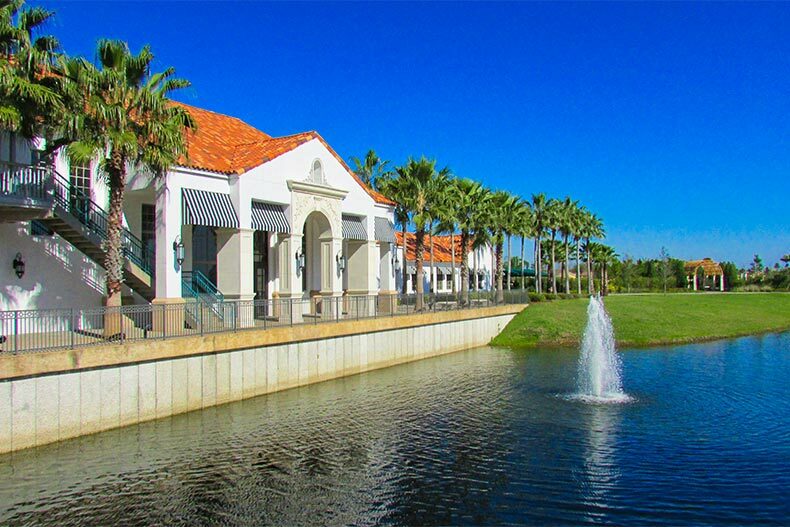 The Villages boasts more amenities per capita than any city or age-restricted neighborhood in the country. Nearly every imaginable amenity can be found in this 55+ community, including three town squares, two bowling alleys, numerous hobby and craft studios, and RV parking. There are also a lot of myths to cut through when it comes to life here. Oak Run offers an ideal blend of large community amenities with a small, close-knit neighborhood feel. This established 55+ community has reasonably priced resale homes and a robust lifestyle offering with over 100 clubs and interest groups. There’s an option to purchase a golf membership or a social membership at Royal Oaks Golf Club, which includes 18 holes of championship golf, a restaurant, and a pro shop.